“What sort of picture do you think the Event Horizon Telescope (EHT) team will reveal tomorrow,” Daniel Clery at Science asked French astrophysicist, Jean-Pierre Luminet, who created the planet’s the first “image” of a black hole in 1979 shown above using an early computer, lots of math and India ink. Astronomers across the globe will hold “six major press conferences” simultaneously tomorrow Wednesday, April 10 to announce the first results of the EHT, a virtual telescope with an effective diameter of the Earth—that has been pointing at the Milky Way’s central supermassive black hole for the last several years. In February, in anticipation of the EHT results, Luminet released an illustrated history of black hole imaging that records decades of progress from pen-and-ink drawings to supercomputer simulations and Hollywood movies. Clery’s interview which can be read here in full was edited for clarity and brevity. Luminet’s 1979 black hole visualization is shown at the top of the page. Using computer data, Luminet drew several thousand black dots on a white sheet by hand and took a photographic negative to get the final image. Gas racing around the black hole toward us is brighter from a Doppler boost. 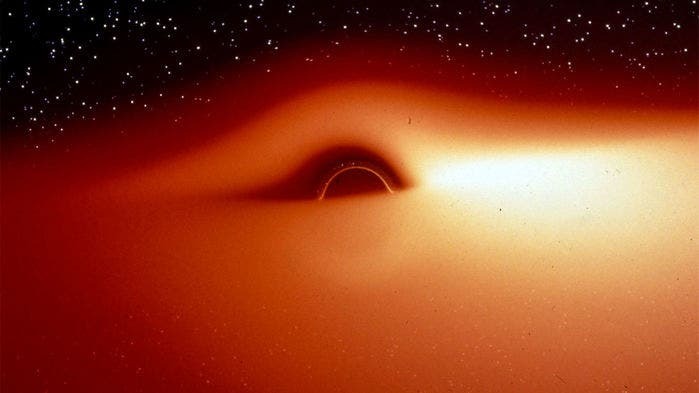 The part of the gas disk behind the black hole is visible above it, because its light has been bent by the black hole’s gravity.